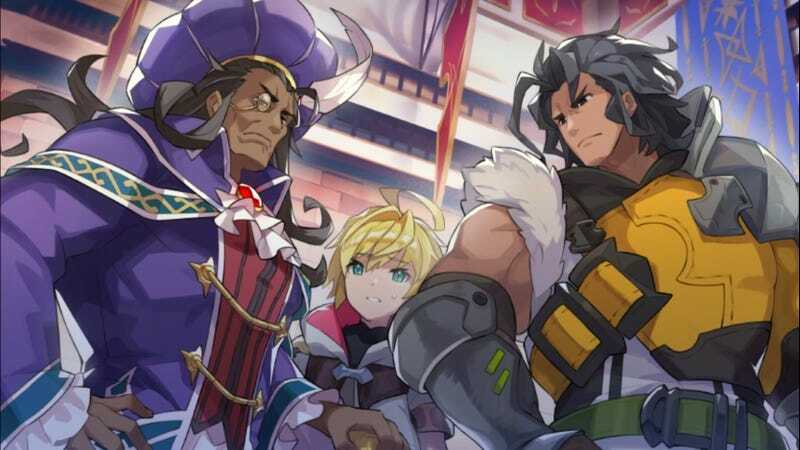 Having torn through Dragalia Lost’s first six story chapters within a couple weeks of launch, I’ve spent the past few months collecting characters and dragons and participating in regular special events while I waited for the narrative to expand. Well, it expanded. I burned through the new stuff in an hour, and now I wait for Chapter 8. I’m still playing Nintendo and Cygame’s Dragalia Lost on a daily basis, as I have been since it dropped in late September. The game’s lovely art style, excellent music and dedication to expanding the narrative of its collectible fighters and beasts got it onto my top ten games of 2018 list. As long as I keep getting new characters and don’t feel pressured to indulge in microtransactions, I’ll keep coming back. I was just hoping the first expansion of the game’s main story would be a bit meatier. With the main character and his companions having established an independent kingdom in direct contention with the Empire that rules the land, Prince Fahey (I named him myself) travels west in search of allies. With a group of brave adventurers and a handful of dragons, most of which look like attractive anime women, Fahey journeys to the city of Aquapolis in hopes of coming to an agreement with the metropolis’ liege. But the marshes surrounding the waterlogged city are brimming with danger. It’s danger that looks a lot like danger players have seen before. The action role-playing portions of Chapter 7 reuse the swampy grounds of the game’s second chapter, which is disappointing. It’s a water-based chapter, meaning players need a strong party of the opposing element—wind—in order to make it through. Fortunately, between playing through Chapter 2 on Hard difficulty and one of the special events from a month ago requiring a strong wind-based party as well, I burned through Chapter 7’s dozen or so battle stages in under an hour. The good news is, Chapter 7’s brief story is excellent. The new characters are intriguing, and the narrative takes some unexpected turns. The bad news? Well, it’s short, and no new party members or dragons are introduced. Hopefully the upcoming Chapter 8 will be a little longer. And if not, maybe Cygames and Nintendo could save up a few chapters and spring them on players all at once. We’ll take more Dragalia Lost any way we can get it.